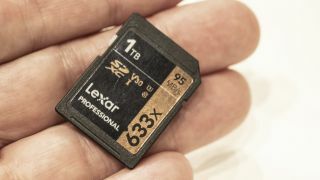 Lexar is planning on launching 1TB SDXC and microSD cards in early next year, it was announced at Photokina 2018. The monster capacity cards, which will have more memory storage than most people's laptops, will both offer a speed rating of 633x, and a data transmission of 95MB/s. The video speed rating will be V30. Lexar has also announced that is ready to launch a CFExpress format card – as soon as there are cameras that use this new class of high-speed card. Lexar is also ready and waiting to launch CFExpress memory cards – as soon as the super-fast standard is adopted by camera manufacturers. The cards will have a speed rating of 1600MB/s – which is four times faster than XQD. Lexar has no current plans to produce XQD cards – as CFExpress cards (which should be backwards compatible with XQD cameras) are four times faster, and do not require paying a licensing fee to Sony. Lexar is fast re-establishing itself in the market since its recent change in ownership. Former owner Micron took the decision to move out consumer flash memory, and sold the business to Chinese company Longsys a year ago. The Lexar operation is still being run from San José, California. The re-born company is keen to point out that it aiming to sell its cards to enthusiast and professional photographers. Every card is tested for compatibility with different cameras. An advantage of its new status, is that it is no longer tied to using just Micron memory in the construction of its cards – it can use flash memory from other suppliers (such as Sony or Toshiba).